Book Review Land Without Past By Philipp Ebeling Reviewed by Adam Bell The erasure of individual and collective memory is often intertwined. Slow and cumulative, one image, one document or brick at a time until the illusion is complete and we’re left with blank spots or holes in the past. Phillips Ebeling’s Land Without Past deals with the painful erasure of one of the 20th centuries darkest moments. Land Without Past. By Philipp Ebeling. The erasure of individual and collective memory is often intertwined. Slow and cumulative, one image, one document or brick at a time until the illusion is complete and we’re left with blank spots or holes in the past. Phillips Ebeling’s Land Without Past deals with the painful erasure of one of the 20th centuries darkest moments. In the wake of WWII, Germany was left not only physically devastated, but forced to reconcile with the crimes it had committed against its Jewish population and the world. For those who participated, a simple denial was often all that was needed to move on. Burn the pictures, rebuild, and forget what happened. For those born in the wake of WWII, the task was not so easy. As Ebeling’s title suggests, they were born into a country without a past, or with part of its recent history excised, glossed over and forgotten, much less discussed openly. Combining his own color images with archival family photographs, Ebeling’s powerful book offers a glimpse into the difficult task of looking backwards, but also living with and acknowledging a past long forgotten. Land Without Past. By Philipp Ebeling. Fishbar, 2014. Measuring approximately 10”x11” with a stark black dust jacket, the book commands a quiet presence. 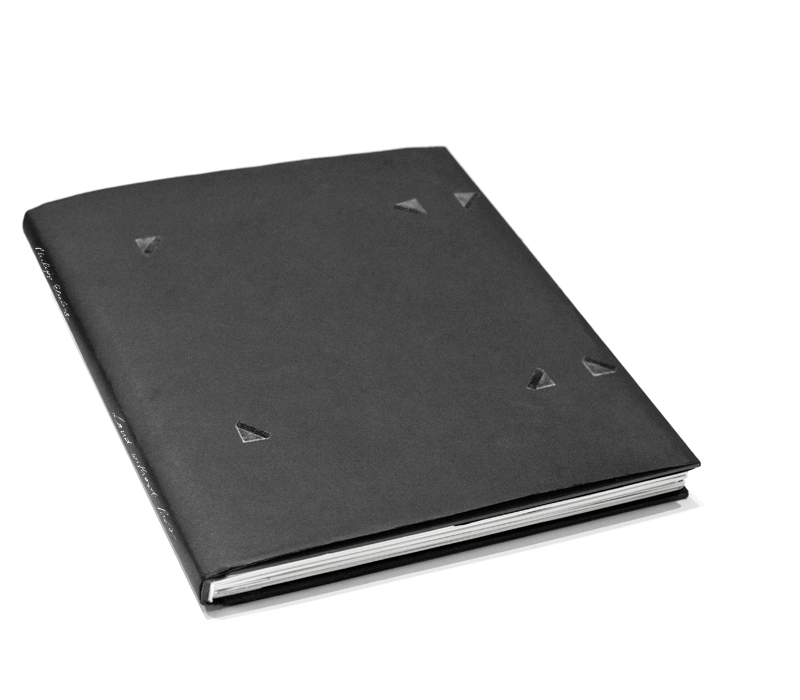 Dotted with empty photocorners, the cover resembles the internal pages of a photo-album. However, like the family albums Ebeling draws from, the photographs have been removed. Only one photograph remains on the back, and shows three happy young adults laying on the grass and looking at the camera. Slightly tilted, the remaining image appears as though it is about fall off the album, soon to be lost as well. Paired with Ebelings own medium format color images, the black and white family photographs inside the book have been enlarged and cropped to match size and proportions the color images. While many are innocuous family snapshots, some are more ominous and suggest a past many have chosen to forget. In one image, a group of Hitler Youth gathers and poses for the camera. In another, a small group of Nazi soldiers march past in the road and turn mid-stride to acknowledge the camera. Ebeling’s own images are full of hidden and suggestive meanings that echo and draw on the older pictures. The book opens with the shot of a pristine house and well-manicured lawn. In typical German fashion, everything is perfectly maintained and organized, but the order seems to be hiding something. The next spread shows an older image of a young boy slouching in an armchair and is paired with a contemporary shot of a train set in the attic. Far from ideal as a playroom, the disheveled and long abandoned set-up shows a cloistered children’s playroom, shut off and insulated from the world outside. In light of the book’s larger themes, the boy’s sullen and annoyed expression takes on more complex meaning. In the book’s final image, we see an older man power washing a sidewalk — another mundane task that takes on greater meaning in the context of the book. While the symbolic meaning of Ebelings photographs works on their own, they are given added depth through the inclusion of the historical photographs, which force us to move constantly backwards and forwards in time, and reframe the present.